Art in the White House: A Nation's Pride by William Kloss, Dorren Bolger, David Park Curry, John Wilmerding, and Betty C. Monkman. Presenting the White House collection of paintings, sculptures, and drawings, this book provides the history of masterpieces by such noted artists as Charles Willson Peale, Albert Bierstadt, and Winslow Homer. This edition includes a new 24-page supplement detailing the acquisitions made from 1992 to 2002. This handsome White House book is written for the general audience and as a resource for scholars. 'Art in the White House: A Nation's Pride' is well organized and well illustrated. 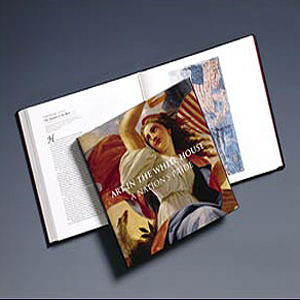 It opens with a brief introduction by John Wilmerding, Sarofim professor of American art at Princeton University, in Princeton, New Jersey, which is useful for the general reader in placing major works in the collection in the broader history of American art.